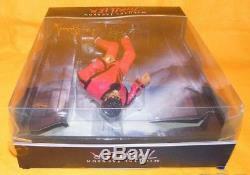 2010 PLAYMATES TOYS / CHARACTER OPTIONS MICHAEL JACKSON THRILLER 10 FULLY ARTICULATING COLLECTIBLE DOLL / ACTION FIGURE MINT BOXED. 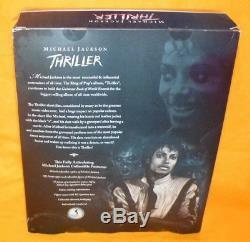 Up for Sale is a 2010 PLAYMATES TOYS / CHARACTER OPTIONS MICHAEL JACKSON THRILLER 10 FULLY ARTICULATING COLLECTIBLE DOLL / ACTION FIGURE MINT & BOXED. Michael Jackson is one cool 9 figure. He is in mint, unplayed with condition and has never been removed from his original box, as seen in the photos. 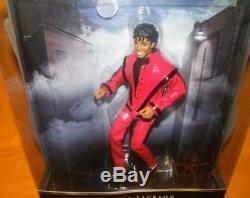 The figure displays well in his box and is complete with his Thriller outfit, as shown. The box is in good condition considering its age and shows some wear with creasing, edge/corner wear, surface scuffs/scratches and paper tears at the bottom. The plastic window is still present and has a slight tint of yellow, some dings, creases at the top/top corners, surface scratches and scuffs. This doesn't detract from this nice toy in any way. The seals at the side of the top flap have lifted but both seals along the long edge are still intact, so the box hasn't been opened. The bottom flap is still sealed with the sellotape still intact. Michael Jackson looks really impressive close-up and is a good likeness! The top flap is still sealed along the long side, with the seals still intact but the side ones have lifted, as shown. It has some creasing, corner/edge wear and the plastic has some dings and creases. This side of the box is in good condition considering its age and size with some creasing, edge/corner wear and scuffs. The plastic has some dings, creases and crushing at the top. This side of the box is in also in good condition considering its age and size with some creasing, edge/corner wear and scuffs. The plastic has some dings and creases at the top. The bottom flap is still sealed with the seals still intact and has some paper tears, creasing, surface scuffs/scratches and edge/corner wear. It is printed with'2010 Triumph International, Ltd. The back of the box displays well and is in good condition with some creases, edge/corner wear, scratches and scuffs, as shown. The top flap is still sealed along the long side, with the seals still intact, as shown but the side ones have lifted. This doesn't detract from this nice Collectible figure in any way. 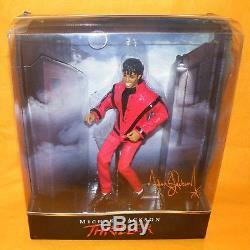 It is a must for any Michael Jackson fan. Michael Jackson is a great character. He comes mostly sealed in his original box and is in mint, unplayed with condition, never removed. The box is is also in good condition considering its age with some wear, as shown. Please feel free to ask any questions. Thanks for looking and Happy Browsing :. 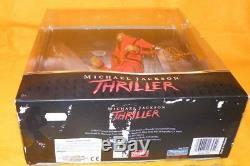 The item "2010 PLAYMATES TOYS / CHARACTER MICHAEL JACKSON THRILLER 10 DOLL FIGURE BOXED" is in sale since Friday, May 11, 2018. This item is in the category "Toys & Games\Action Figures\Music". The seller is "traceandtrev" and is located in Manchester. This item can be shipped worldwide.